It’s hard to be a very visible phone brand, especially in a world where everyone knows how good a deal they can get from all these Android devices that are out to chew into markets “owned” by household names. Once again Gtel has something for the people that offers what a lot of manufacturers are failing to give, a “smart phone” that does not need for you to go carrying your charger/data cable to leech off of any power source in the hopes of not having the phone shut down on you at a critical time. Gtel has managed to achieve this by providing a phone with a hefty 5000mAh battery. For those not in the know, the average phone battery capacity hovers in the 2000-2600mAh range. The beasts of the battery realm are in the 3000mAh regions. Gtel though has decided to up the ante and give the customers what they need, with the slight sacrifice of thickness and weight. This is a white labelled Gionee smartphone, customised for the Gtel ecosystem, and as such carries their design spec which is a plastic exterior. This should not be a problem considering that a lot of the big manufacturers use similar materials. The phone’s battery is sealed (into the phone) and is therefore none user replaceable. The back fits very snuggly and does not peel off easily, and when closed the seams are very tight. The front of the device has hardware capacitive touch buttons, which depending on your taste can be a plus or a minus. In my case, they are a preference as I find on screen buttons annoying when viewing video. 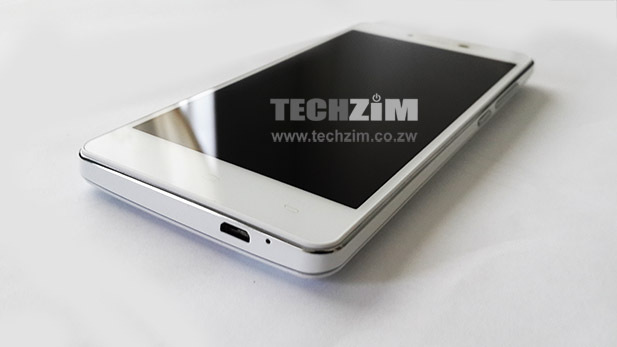 The back has the 8MP camera, LED flash and the speaker grille. Removing the back cover reveals the SIM access and micro-SD slots and the massive 5000mAh battery. 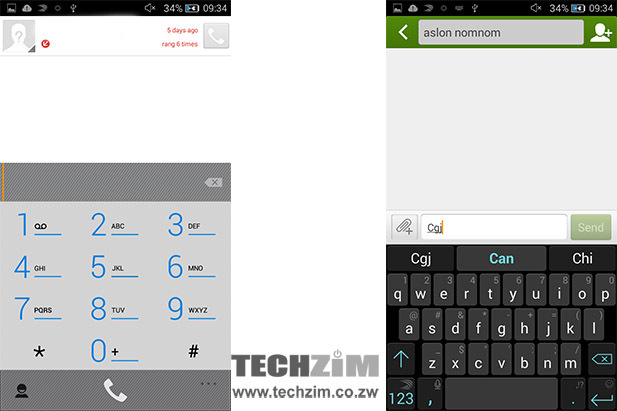 The SIM can be placed without switching off the phone but will only become active after the phone has been rebooted. On the right side, you have both the volume rocker and the power button all within reach, which was a good idea from the design team considering the phone’s size. The Gtel Xplora A718 is a dual SIM phone which uses micro-SIM cards. Given our less than reliable networks, the dual SIM setup is a good idea, and with the Gtel Xplora A718 power pack, there are almost no worries about there being a short lived battery. 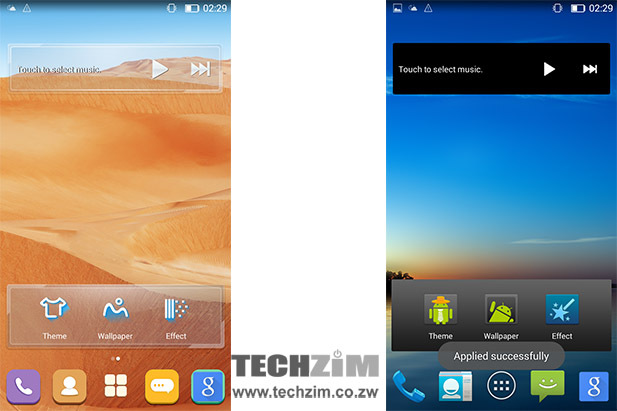 The Gtel Xplora A718 comes with the regular Google apps, ie chrome browser, Gmail, Google+ hangouts etc. it also adds to Google’s default apps its own selection, including the NQ Mobile security which is a mobile anti-virus with a few added features like call blocking, account protection and an App manager. 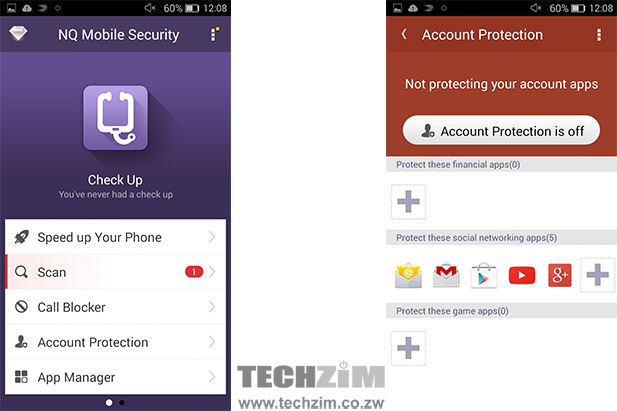 The account protection function is there to prevent access to your social networking apps. Considering the spate of social media attacks that people experience, it is a good contribution to the security section of phone operating systems. The App manager function allows the user to delete/uninstall apps that have been loaded onto the phone, including pre-loaded system apps. However to remove system apps requires root privileges, and as is commonly known Rooting a phone voids any warranty that might come with the device. Given that the Gtel Xplora A718 like most other Gtel phones come with a 12+ 3 months warranty, this is a risk I doubt most people out there would be willing to take as that would mean issues should any mishap befall the user. Also included with the phone is a favourite of many people out there, the FM radio function, a Customer service app and a themer which I found rather handy as I found the default theme not to my taste. One of the few qualms I have with many of the phones that are not from the “big players” is the storage, which is always for some reason lacking. As of 2014, at the very least I would expect the minimum storage space that would be given to consumers is 16GB. 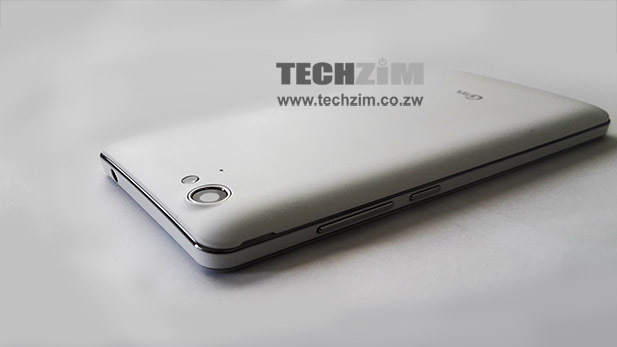 The Gtel Xplora A718, unfortunately, comes with 8GB of that only about 5GB is user addressable, the rest goes to the system. The review model came with an 8GB card installed in the micro-SD slot, and that helps with storing files. 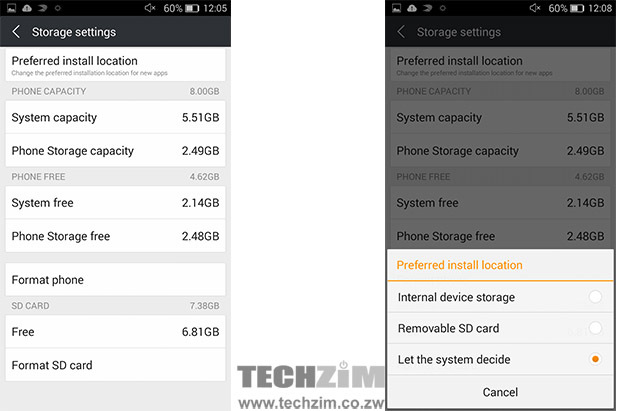 For app installing, restrictions placed by Google on external storage mean that internal storage quickly fills the internal memory. This is likely to happen if a user is an app junkie. The display on the Gtel Xplora A718, is decent, with a resolution of 1280×720, which on a 5” screen gives an approximate pixel density of 294ppi. The display is sufficient for most purposes and is bright enough both indoors and outdoors. The response on the touch was also good, but it is limited to x simultaneous touch points. The camera on the Gtel Xplora A718 is decent for most captures in normal light, low light performance like most phones in its category is less than desirable. In low light the images are rather grainy and have heavy artifacting. The camera comes with the now regular features like HDR, exposure geotagging, exposure etc. however it also allows the user to change ISO setting up to a claimed 1600units. In my experience manually setting the ISO levels did little to improve the quality of the pictures taken. HDR mode though did greatly improve the pictures taken, even in low light. Depending on the theme selected the interface, will look different though it will function the same. I enjoyed the fact that I was not constrained to the default system theme and did not have to download a third party app for the feature. 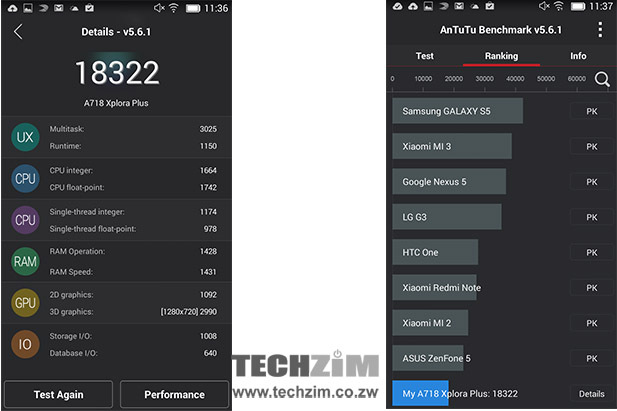 Performance for the Gtel Xplora A718 was within expected margins for a mid-tier phone which is made to last, and not to perform. The telephony experience was decent though occasionally the reception was rather bad. This I assumed was due to issues with the network quality. The skinning of the interface also depended on the themer that comes with the phone. In the end, I found the best of the skins was the one that resembles stock Android. 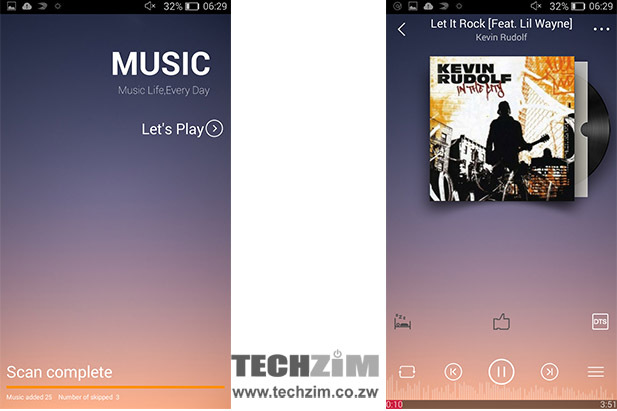 I was impressed by the audio player on the Gtel Xplora A718, mostly because it seems a rather feature rich player, with some of the features available from premium apps on the PlayStore. One of these features was the DTS feature and the ability to play by folder and not necessarily by artist. Meaning the issue of improperly tagged tracks and or folders with a compilation of your favourite tracks from different artists would be easily playable. My one issue with the audio player is that one needs to have the app scan folders before being able to listen to some tracks, the reason being the app does not auto scan its music folders. 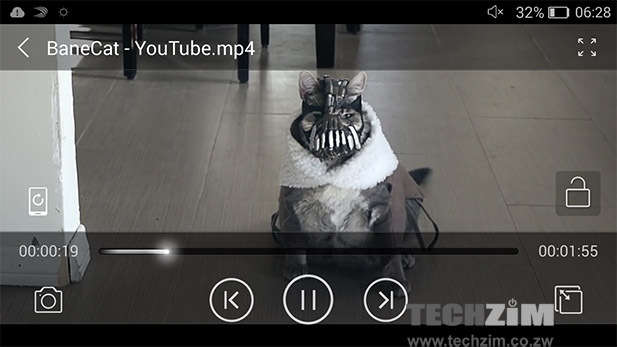 The video player was also a fully featured player, allowing the user not just to change volume, seek and screen brightness, but also allows the user to lock video when using the phone. This is a handy feature while watching video on the move as sometimes the viewing experience is disturbed by bumps and the phone sometimes misreads the movements and rotates the video. With this feature, the phone can lock the video and viewing would remain uninterrupted. 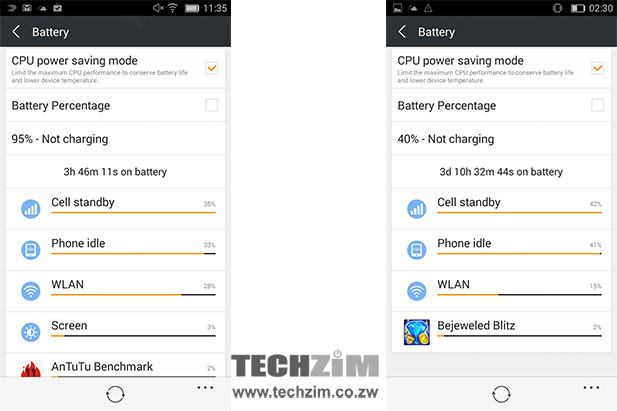 The biggest feature of all on the Gtel Xplora A718 is the battery. If anything the phone could be said to be the first of its kind to cater for what customers want. The battery’s performance was phenomenal in my experience, I took the phone through normal and heavy use, and no matter what I did, and the battery was slow on depletion. Normally one would worry about seeing the next day with a charge. With the Gtel Xplora A718, I believe it is possible to see more than just the next day. One drawback apart from the weight that comes with the battery is that it takes a while to fully charge the phone. Then again, most of the time charging is done at night, so this should not be an issue. It is good that Gtel has gone the extra mile to accommodate customers’ needs by providing a phone with a good battery. Slim phones are nice to look at, but the truth is that in everyday life we always find those slim figures to be lacking when endurance is needed both for making calls and physical endurance. I would be happy with a slightly thick phone that wouldn’t have me begging to use the nearest USB port/ power outlet. All in all, if you don’t want to go carrying a charger with you or occasionally make long trips without access to power outlets, this would be the phone of choice. With a price tag of $275, it is as good a deal as you get for a phone that does more than have a bigger battery. I must say i wanted to buy one of Gtel’s phones on credit and they told me i did not qualify because i did not work for a firm that buys phones from them. I earn more than 90% of civil servants and everyone in my company uses Iphones,,,,they do not want to open credit lines with Gtel. I was really annoyed at the fact that becoz our company do not have an account with them they cannot allow me to buy on credit like Edgars, Tv Sales and Home. I wonder does that mean i can only buy on credit if im a civil servant?.i have never had any problems in paying my accounts at DSTV, Edgars, TV Sales and Home etc. What is so special about Gtel? Really i would have loved to support the local guys but that shrinked attitude wont make them bigger than they are right now. Nhai hako iwe ngavatenge iPhone vanyerere! lets jus say g-tel is a nice phone lets not compare it ne iPhone its like comparing ipsum ne BMW.